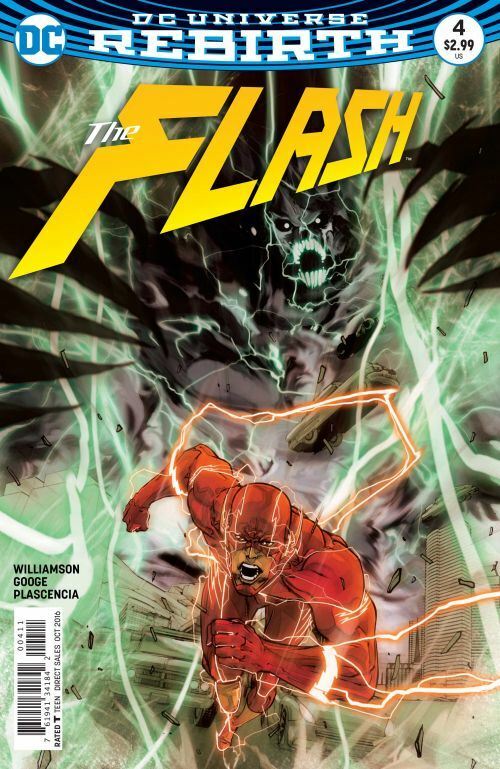 The Flash series continues to surprise and impress with issue 4. The situation builds quite naturally following the dramatic developments in the last few issues. Now there are many people with speed force powers in Central City, though not all of them manifest identical abilities. The Flash’s circle of friends and allies now includes both August and Meena as speedsters. While the various incarnations of the Flash have never been short on running alongside others (Jay Garrick, Wally West, Red Trinity, Johnny Quick, Jesse Quick, Impulse, etc etc), the dynamic is very different in this series. The Flash is a teacher and a mentor, a leader by example and by experience. August and Meena have distinct personalities, and as has already been established in the book, look up to the Flash, but don’t always agree with him. Iris and Wally West remain in minor supporting roles. Iris is more directly involved in the main plot, working to determine the precise connection between the experiments at S.T.A.R. Labs and Godspeed. Wally is more sidelined. Neil Googe does a very good job with the art on this issue, balancing the look of ordinary people with super speed action. Lots of big swirly stuff. I tend to like big swirly stuff. There are a couple of good twists in the story, pertaining to Dr. Carver of S.T.A.R. Labs, and to the Flash himself. The final page is, once again, one that I cannot really talk about. But it uses a standard line from the strip in a strong and effective way.